“Maalox is a must.” That’s one of the many tips to be found in “Defending Against Tear Gas,” a fascinating flier making the rounds on the internet today (and shown in full below—click to embiggen), that instructs Occupy protesters on how to protect themselves when The Man breaks out the CS canisters for crowd dispersal. As some cops and local governments get physical in their dealings with occupiers, the flier’s info could prove vital to minimizing chaos and injuries. It also shows how information-sharing among the protesters and their sympathizers is spreading organically at a rapid clip. 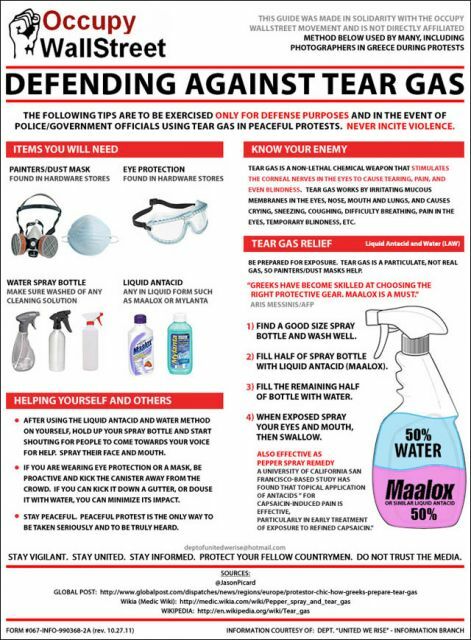 The flier, which urges that its tips be used “only for defense purposes” and exhorts protesters to “never incite violence,” is distributed by an unknown party with a Hotmail account who says it is “not directly affiliated” with the Occupy Wall Street Movement. Its data appears to be crowdsourced from Wikipedia, Global Post, and Agence-France Press, among others.